Steeped in a rich tradition, heritage, and history, the Indian Creak Vineyard is nestled in Stark County 1.5 miles north of Toulon, Illinois. Named after the creek bordering the vineyard, a vista of beauty and elegance has been created. Near the same land once occupied by the last settlement of the Pottawattomie Indians in Stark County, now lies a 12 acre Illinois vineyard. Marachel Foch, Fronenac, Lacrosse, St. Pepin and Leon Melot are among the varieties of grapes grown for producing fine Illinois wines. 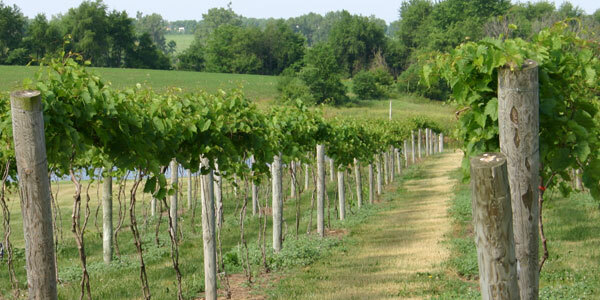 Indian Creek Vineyard is located on our family farm, which has been in the family since 1836. The original house was completed in 1840 with an addition in 1853. The remodeling project included removing the 1840 structure and blending the new with the addition of 1853 to make the present Chateau. The Chateau serves as a bed and breakfast with four bedrooms. The Chateau also has a great room available for parties up to 60 people. The Old Red Barn, once used for milking cows and storing hay now serves as a wine shop and a wine tasting room. In addition to the wines from Indian Creek Vineyard, wines from several other Illinois wineries are available. The wine shop is open for tasting every Saturday and Sunday from 1 p.m. to 5 p.m. from May through December, and is also open by appointment. The Indian Creek Pavilion is located behind the wine shop and is also available to be used for weddings and gatherings. My name is Fred J. Sams, and I was born and raised on this farm. I would like to cordially invite you to sample my wines, walk around the vineyard and enjoy a glass of wine on the deck overlooking picturesque Indian Creek Vineyard and pond and have a "grape" experience.